Mom, these Thai Peanut chicken Tacos are for you! 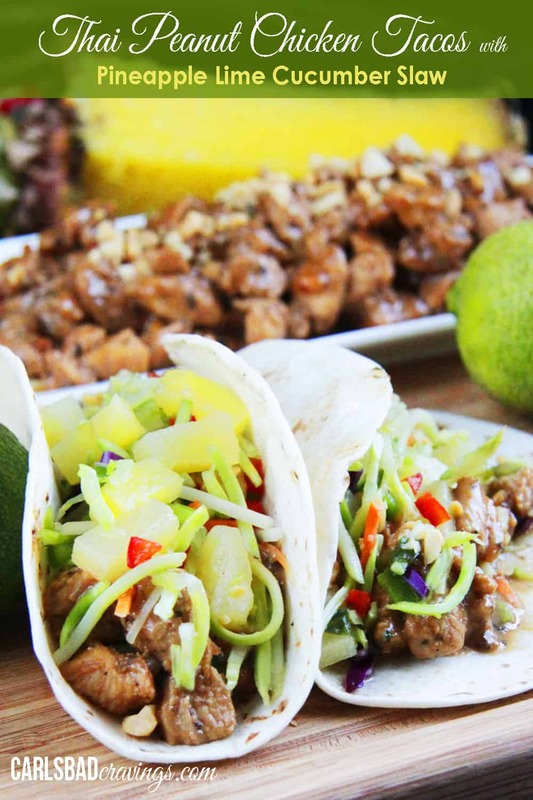 So I totally would have made these Thai Peanut Chicken Tacos with Pineapple Lime Cucumber Slaw for Mother’s Day (although I don’t regret my Blackberry Hoisin Ginger Pork Tenderloin – A-M-A-Z-I-N-G!) if I hadn’t just brought them to my mom’s for lunch the week before. She was going CRAZY for them! And I was too! So I only remember her exact words despite my terrible memory (cue this post which explains my lunge hemorrhage and temporary brain swelling), because after I create a recipe and then savor it (okay its more like snarf it – I am not that patient after having to first take my food pics), I like to write down my impressions or Patrick’s reaction and note all the different flavors because it can be months before I actually post it with commentary. The “explosion of flavor” from these “amazing” tacos comes by marinating the chicken for 30 minutes in soy sauce, brown sugar, lime, fish sauce, basil, garlic and ginger. The chicken is then cooked in the marinade and then crunchy peanut butter is stirred in to create an “insane” peanut sauce coated chicken which you will “love, love, love, love love!” The Pineapple Lime Cucumber Slaw is is sweet and citrusy, refreshing and crunchy, which “perfectly compliments,” and brightens the “crazy flavorful” peanut chicken. Seriously, these tacos are one of my favorite meals E-V-E-R! I “can’t even handle” how good they are! And although the name might sound long, it doesn’t meant these take long to make- just look at the directions – SO EASY! 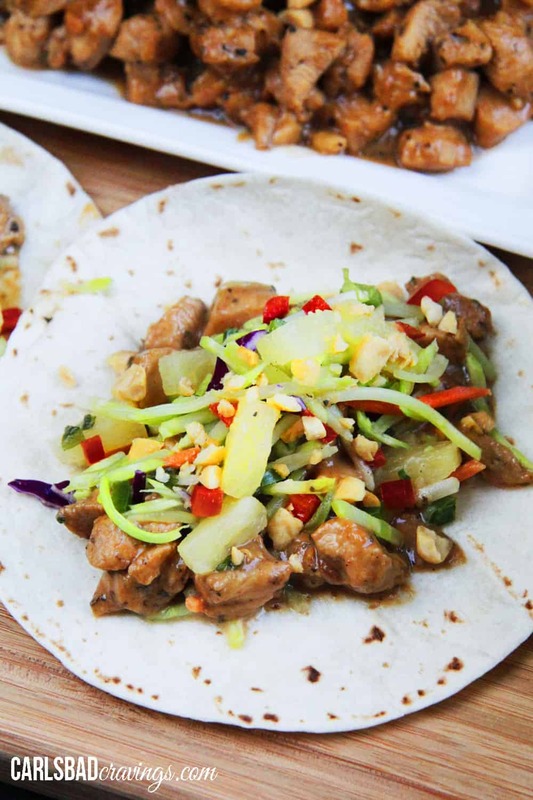 Simply marinate chicken, stir fry chicken and stir in peanut butter; then marinate slaw then top chicken in tortillas with slaw. SO EASY! I hope you make these “truly amazing,” “restaurant quality” Thai Peanut Chicken Tacos with Pineapple Lime Cucumber Slaw soon because I can’t wait to hear what impressions you would have written down and to see if you too, “can’t even handle” the “so many dimensions of flavor” :)! 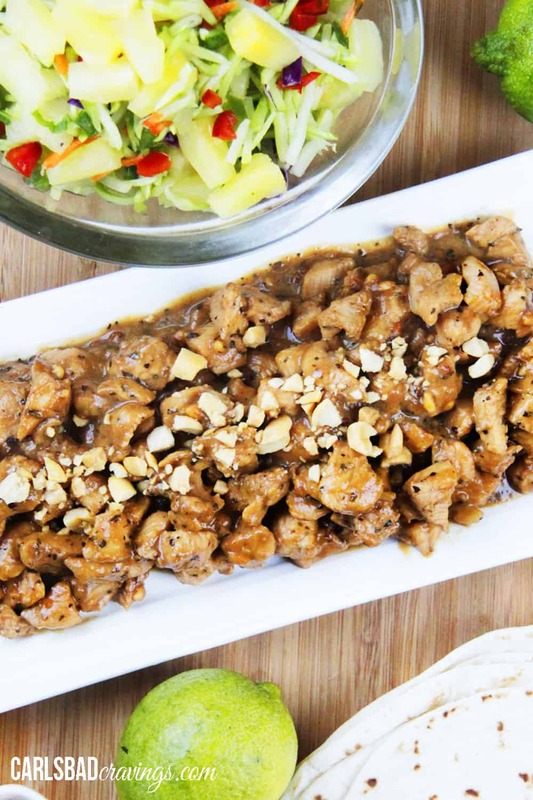 Combine the Thai Peanut Chicken ingredients, EXCEPT for the peanut butter, and marinate 30-60 minutes. Meanwhile, chop ingredients for your Pineapple Lime Cucumber Slaw then whisk together the first 5 ingredients for the slaw in a large bowl. Add the rest of the ingredients and toss to combine. Marinate in the refrigerator. When ready to cook, heat 1 tablespoon olive oil/coconut oil in a large nonstick skillet over medium heat until hot and rippling. Add chicken and marinade and cook until completely cooked through and marinade/sauce thickens. Stir in crunchy peanut butter until well combined. 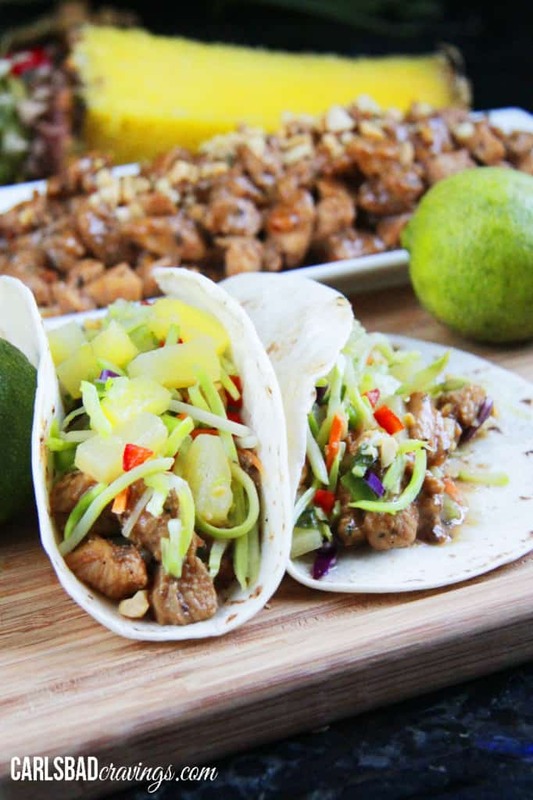 Assemble by adding chicken to tortillas and topping with Pineapple Lime Cucumber Slaw and chopped peanuts. Note that there will be some extra slaw "marinade" in the bowl after chilling which you can discard. *If your store does not carry cucumber slaw, then use broccoli slaw. I have found it equally delicious! Oh my gosh was an original take on a taco! We think so much alike Jennifer! Absolutely love it! Pinning! This looks delicious! Thanks for sharing your yummy recipes! It is my absolute pleasure! I hope you enjoy! This looks so good! Very refreshing and cool for summer! YUM! Thanks Lindsay! I love food that tastes and feels like summer! This looks so good that I pinned it. I would love to make this. Thank you for sharing. My pleasure Ann! I think you will love it! Love the Asian-Mexican fusion. Looks yummy and light. Thanks Rachel! I love fresh pineapple in the summer – I have to keep myself from using it in everything! 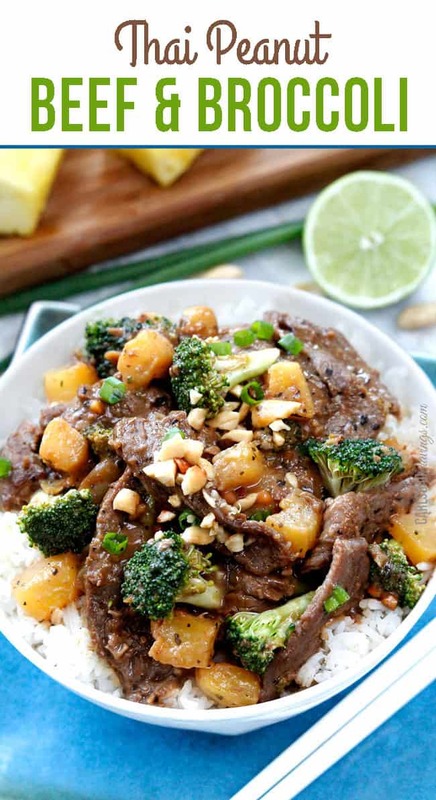 Excited for you to try it and thanks for pinning! Oh my god, that looks and sounds like it would be tasty! Thank’s Tiffany! I am excited for you to try them and see just how tasty they are :)! What a beautiful dish! Love the combination of textures, colors and flavors! Well done! Thank you so much Linda! It is definitely one of my favorites so I’m always excited when others share my same excitement! These look like the perfect summer meal! I love the flavors! Thanks Jessica! Can’t wait for you to try it! 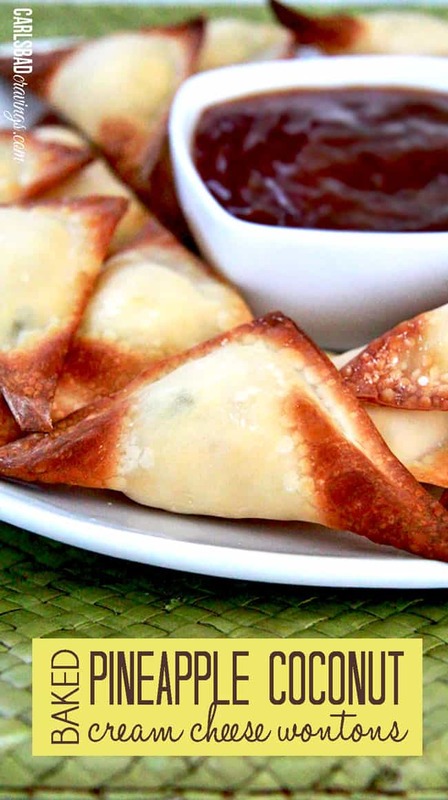 These look awesome, I am planning on making them for supper tonight. However, I noticed that the recipe on the blog calls for cucumber slaw, but the printed version says broccoli slaw? I could not find cucumber slaw, so I am going to make my own with my sprializer. Hi Natasha, I was waiting to make it back to the store so I could get you the brand name but I haven’t made it yet, so I figure I better just respond now! I am learning that cucumber slaw is not readily available in many areas so I have changed the recipe to be OR broccoli slaw. My aunt made it with broccoli slaw and she said it was wonderful. So would go ahead and make it with broccoli slaw. Enjoy and thanks for visiting! We had these for dinner tonight, and they were a huge hit with the whole family, even after I was a bit heavy handed with the peanut butter. The slaw absolutely made the dish. (I’ve never seen cucumber slaw locally, and the store was out of broccoli slaw – I subbed shredded red cabbage and shredded carrots, and it was still outstanding.) Served with an Asian pasta salad and steamed edamame. We’ll definitely have these again soon! 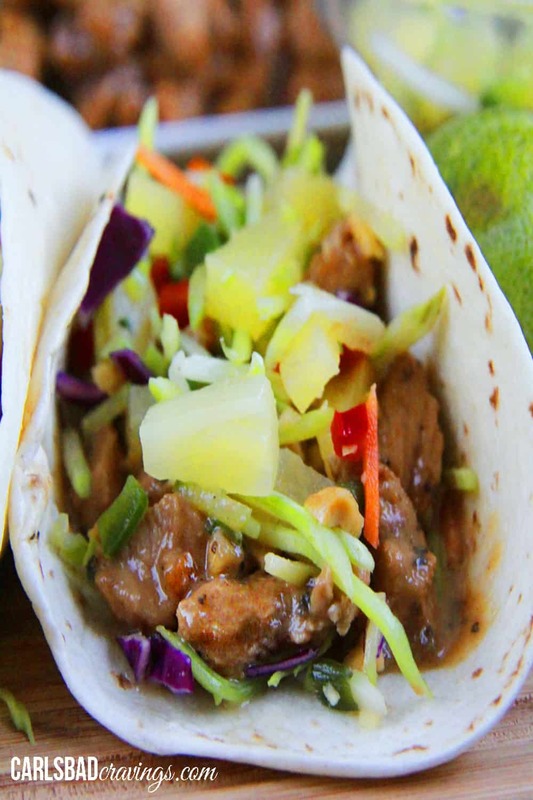 Hi Lori, I am so happy you made the Thai Peanut Chicken Tacos as they are one of my favs! Your slaw sounds delicious as does your pasta salad and steamed edamame – what a feast! I hope your family knows how lucky they are to have you 🙂 Thanks for letting me know how much you enjoyed them – I LOVE hearing that! OMG. Made these tonight to rave reviews from hubby and 2 teenage boys! My favorite food is Thai! However, the men in my life were not convinced, UNTIL I served these!! Not too spicy or sweet. 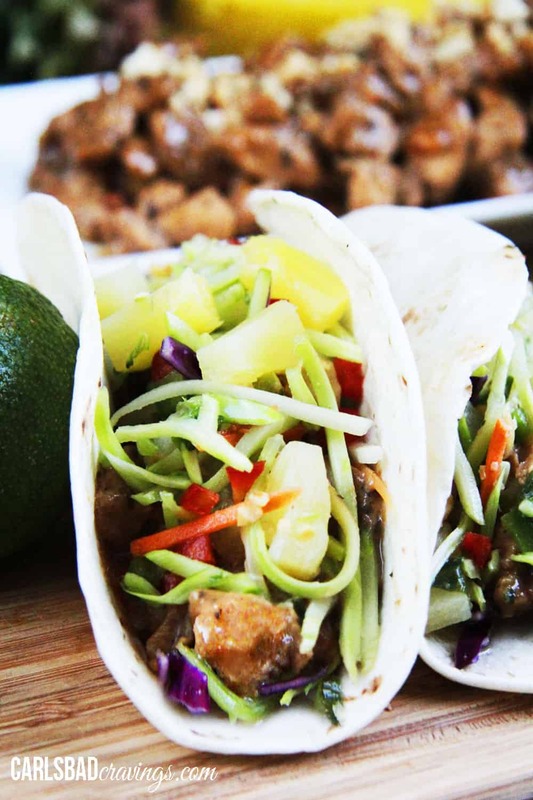 The texture and flavor of these tacos are ‘out of this world’!! My sons have requested that I quit making those ground meat taco’s. That is a compliment if I haven’t heard one before! Thank you for sharing this amazing recipe that won the hearts of my men!!! Jen – Since the first of the year, I’ve made SIX of the recipes form your blog. Tonight’s dinner was the Thai Chicken Tacos and they were just as fantastic as everything else I’ve made. 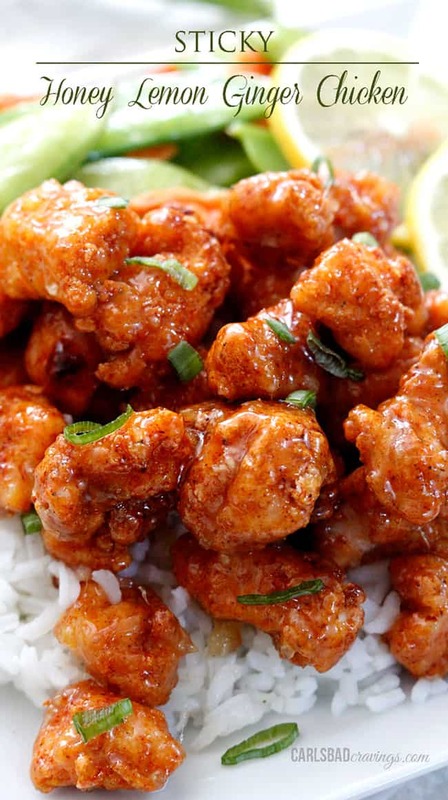 I made General Tso’ Chicken twice in January and every recipe we’ve tried feeds two of us at least twice … often more. I simply cannot thank you enough. The flavors in your recipes are the flavors we crave. We’ve eaten better following your blog than any recent restaurant meal I can remember. 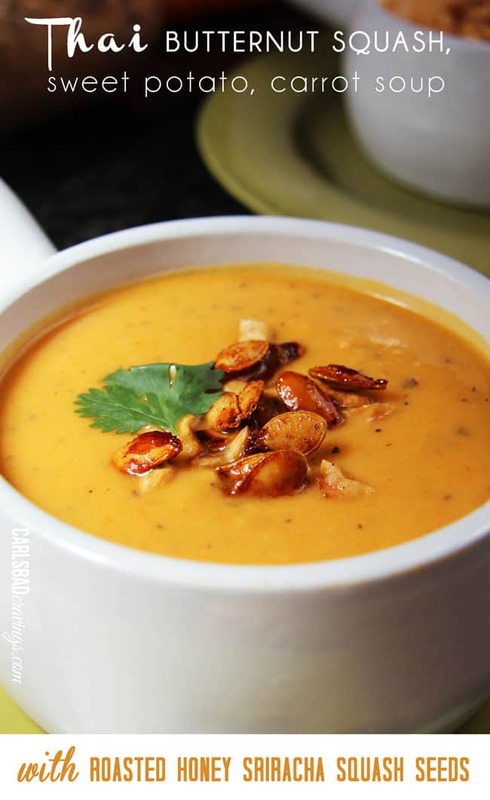 So, bravo to you – we can’t wait to see what else is simmering in your mind as you conjure up more delicious dishes! Hi Jennifer, you made my day! I know how fun it can be to find a blog where someone shares your same cravings, so I am so happy you found my site and are enjoying my recipes. THANK YOU so much for letting me know! 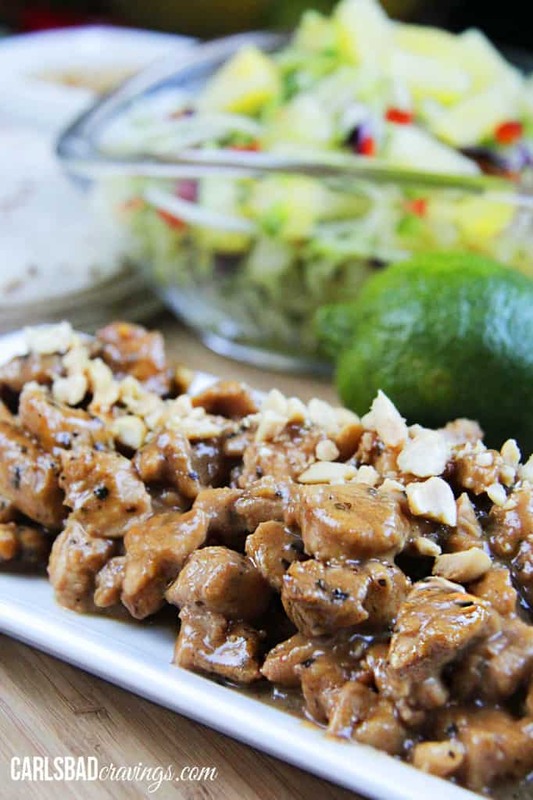 You definitely have good taste – General Tso’s and this Thai Peanut Chicken are two of my favorites! I hope you have fun continuing to explore my recipes. Thanks again for being such a sweetheart!